Striker Likers: Show Us The Jersey! Could this be something we might see come April? 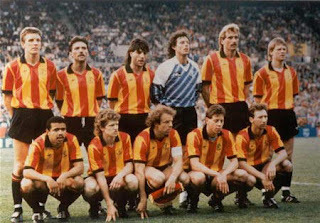 Searching through Joma's current roster of clients, we stumbled on a few red and gold clubs whose uniforms may lend themselves to the latest reincarnation of the Fort Lauderdale Strikers. Above you'll see Jagiellonia Bialystok, a Polish club sponsored by Joma. Nice similar colors, but the red shorts and gold socks aren't true Striker material. A closer match might be Belgian side, KV Mechelen. Take a look back at this throwback pic, colors match perfectly, and we've got black shorts. Only problem is the hoops are going the wrong way. A little trivia, the guy in the middle front row, the captain, is tennis pro Kim Clijster's dad, Lei Clijster. But back to the point, does anyone have a clue what we will see against Edmonton? We're dying to know.